An ovarian cyst is a fluid-filled pocket in or on the ovary. These cysts are common. There are different types of cysts based on where they develop or what material is in the cyst. There are a variety of reasons an ovarian cyst may develop depending on the type. 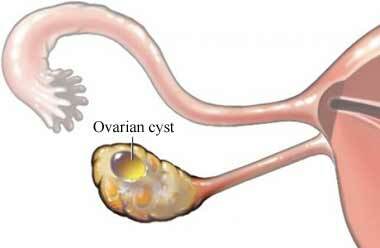 Follicular cyst—Ovaries have a number of follicles (a fluid-filled sac) that each contain an egg. During the ovulation process, a follicle should release the egg. A follicular cyst is caused by an egg that is not released. The follicle, trapped egg, and fluids make up the cyst. Teratoma or dermoid cyst—May be present from birth or develop later in life. Can include tissue from other parts of the body like teeth and hair. Endometrioma—Caused by endometriosis, a condition that allows uterine tissue to grow outside of the uterus. Cysts may grow and become filled with fluid, often blood. Cystadenoma—Grows from cells that line the outside of the ovary. Can become large and painful. Some cysts can also be caused by pelvic infections that have spread to the ovaries. The fallopian tube may become twisted because of the cyst or a cyst may rupture. This can cause severe pain, nausea, vomiting, or bleeding that will require medical care. You will be asked about your symptoms and medical history. A pelvic exam will also be done. Cysts are often found during routine pelvic exams. The doctor can determine factors like size that will help decide if more testing is needed. If a cyst is found, it may simply be monitored for any changes. For cysts that are causing problems, treatment will depend on factors like age, menstrual status, type of cyst, and symptoms. Cysts that develop in women over 40 years of age have a higher risk of developing into cancer. These cysts will be closely monitored for changes, or may be removed as precaution. Cysts that are large, growing, solid, or remain longer than 2-3 menstrual cycles may be removed. Cysts that are causing severe bleeding or pain may require emergency surgical removal. Most operations for ovarian cysts can be done with laparoscopy. This surgery uses small incisions to reach the cysts to help decrease recovery time. When possible the cyst will be removed and the ovary will be left in place. Sometimes the ovary will need to be removed . Ovaries provide hormones that stimulate menstruation. If both ovaries are removed, menopause will begin right away. If you have frequent problems, talk to you doctor about ways to reduce your risks. Adnexal mass. EBSCO DynaMed Plus website. Available at: http://www.dynamed.com/topics/dmp~AN~T115395/Adnexal-mass . Updated May 10, 2017. Accessed December 12, 2017. Ovarian cysts. Office on Women's Health—US Department of Health and Human Services website. Available at: https://www.womenshealth.gov/a-z-topics/ovarian-cysts. Updated April 28, 2017. Accessed December 12, 2017. Benign ovarian masses. Merck Manual Professional Version website. Available at: https://www.merckmanuals.com/professional/gynecology-and-obstetrics/benign-gynecologic-lesions/benign-ovarian-masses. Updated March 2017. Accessed December 12, 2017.